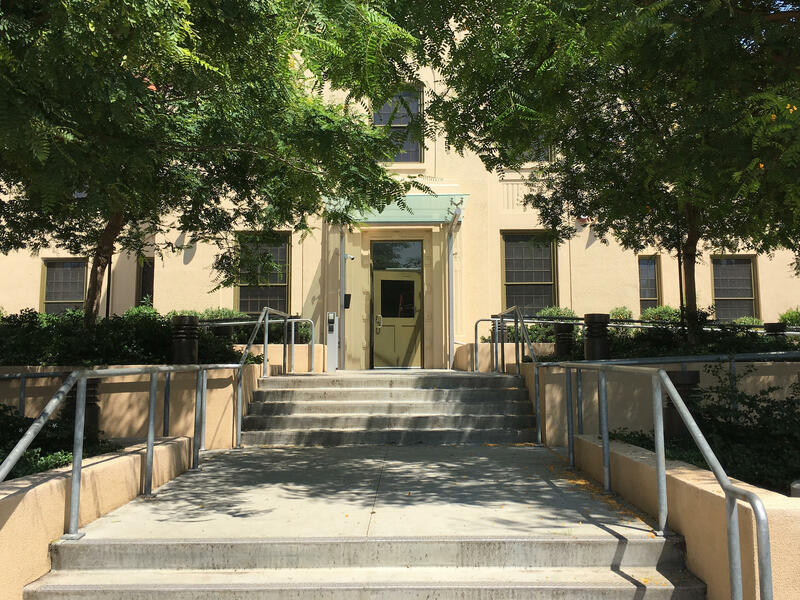 Building 209 is the only building so far renovated to house chronically homeless veterans at the VA West Los Angeles Medical Center campus. The nearly 400 acres of the VA West Los Angeles Medical Center were donated in the 19th century to be a home for old and disabled soldiers. The land hasn't been used that way in decades. Meghan Flanz is in charge of turning the VA West Los Angeles campus into a community for at least 1,200 chronically homeless veterans. She hopes this former soccer field will be turned into new housing for female veterans and their children. William Williamson was a jet mechanic on an aircraft carrier during the Vietnam War. 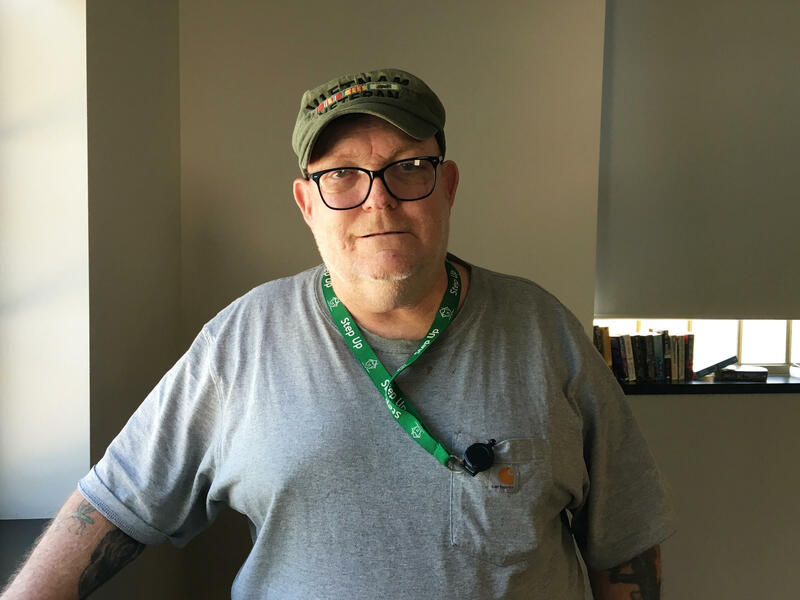 Now Williamson lives close to all his doctors at the VA Medical Center who help him with his asthma, heart problems and nerve damage in both legs. A vast green space in one of the poshest neighborhoods in Los Angeles is slated to become a haven for homeless veterans. That's a big change for the campus of the VA West Los Angeles Medical Center. The nearly 400 acres of the VA West Los Angeles Medical Center were donated in the 19th century to be a home for old and disabled soldiers. But the land hasn't been used that way in decades. More recently it's been home to parking lots for school buses and rental cars, a commercial laundry for hotels, a storage facility for TV shows, among other uses having nothing to do with veterans. So when he became secretary of the Department of Veterans Affairs in 2014, Robert McDonald examined all of those rental agreements. "The money didn't add up," he says. "There was some indication of payoffs, of bribery." There had been no public accounting of what the VA West Los Angeles took in from these rentals or where the money went. NPR obtained documents in 2012 that showed the rentals at the VA had brought in at least $28 million and maybe more than $40 million. At the same time, there was no action on plans to create housing on the campus for homeless vets. McDonald says the parking lot deals looked particularly fishy. "If there's a sweetheart deal going on, who made that sweetheart deal and what are they getting out of it?" A man named David Richard Scott got a lot out of those deals. He had the parking concession on the campus and lied about how much money he took in. As a result, the VA didn't get what it was owed. According to court documents, Scott shortchanged the government more than $13 million. In May, he pleaded guilty to fraud, forfeited millions in cash, cars and real estate, and agreed to serve nearly six years in prison. Scott got away with the scam because he was bribing another man named Ralph Tillman, who oversaw all the rental deals on the VA campus. Tillman has also pleaded guilty and faces a maximum sentence of eight years in prison. "We need to rebuild veterans' trust in what we're doing on this campus," says Meghan Flanz, who is in charge of turning the VA West Los Angeles campus into a community for at least 1,200 chronically homeless veterans. The plan was part of a settlement of a lawsuit brought by homeless vets. Despite the history of conflict and corruption at VA West Los Angeles, Flanz moved from Washington, D.C., back to her native Southern California to take what she describes as her dream job. The vision is huge. It encompasses not only housing with on-site services but places for residents to socialize, to get job training, to make music and art. The obstacles are also huge. They include the need to find funding to renovate some of the campus's many empty buildings or build new housing from scratch. But the VA does not foot the bill for veteran housing. It is now trying to hire a developer who knows how to piece together funds from an assortment of local, state and federal programs. So out of the 1,200 or more veterans who might someday live on the campus, there are now just 54 who do — all of them in Building 209. It's the only one that has been converted to housing so far. William Williamson loves it. He lost his permanent housing three years ago in a roommate dispute. Then it was couch surfing, a shelter and, eventually, the street. That was "eye-opening," Williamson says. It was especially scary at night, "when you try to find a place to sleep, 'cause you never know what's going to happen." Now Williamson lives close to all his doctors at the VA Medical Center who help him with his asthma, heart problems and nerve damage in both legs. And the social services in the building help him with everything from military benefits to grief over the death of a friend. An outside organization called Step Up on Second provides those services. But Tod Lipka, the CEO, says there's one thing his organization can't provide for the residents here — community. Here in Los Angeles, there is a vast, green space in a very posh neighborhood that may soon become a haven for homeless veterans. And this is going to be a big change for the campus of the West Los Angeles Veterans Administration. For years, parts of the property were illegally rented to a variety of commercial enterprises that had nothing to do with helping veterans. NPR's Ina Jaffe reports that this month, two men involved in those deals are going to be sentenced to federal prison for bribery and fraud. 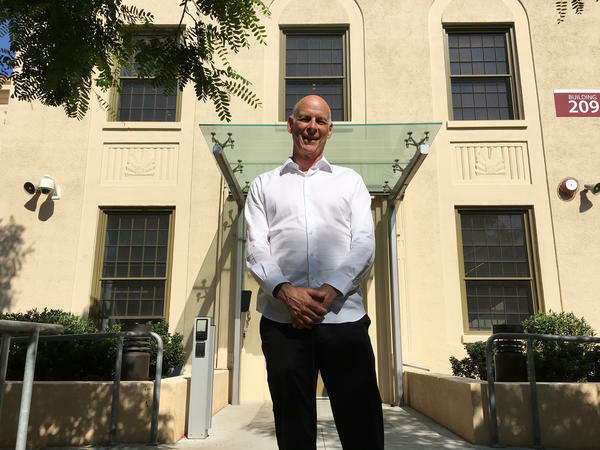 INA JAFFE, BYLINE: The nearly 400 acres of the West Los Angeles VA Medical Center were donated in the 19th century to be a home for old and disabled soldiers. It hasn't been that in decades. More recently, it's been home to parking lots for school buses and rental cars, a commercial laundry for hotels, a storage facility for TV shows and so on. ROBERT MCDONALD: The money didn't add up. There was some indication of payoffs, of bribery. JAFFE: ...Says Robert McDonald, who examined all the rental deals when he became Veterans Administration secretary in 2014. MCDONALD: And if we found monkey business, we turned it over to the FBI. JAFFE: There had been no public accounting. NPR obtained documents in 2012 that show that West LA VA rentals had brought in at least $28 million and maybe more than 40 million. At the same time, there was no action on plans to create housing on campus for homeless vets. Former VA Secretary McDonald says the parking lot deals look particularly fishy. MCDONALD: And if there's a sweetheart deal going on, who made that sweetheart deal? And what are they getting out of it? JAFFE: A man named David Richard Scott got a lot. He had the parking concession and lied about how much he took in, so the VA didn't get what it was owed. According to court documents, he shortchanged the government more than $13 million. He pleaded guilty to fraud, forfeited millions in cash, cars and real estate and agreed to serve nearly six years in prison. He got away with the scam because he was bribing a man named Ralph Tillman who oversaw all the rental deals on the VA campus. Tillman has pleaded guilty and faces a maximum sentence of eight years in prison. MEGHAN FLANZ: We need to rebuild veterans' trust in what we're doing on this campus. We need to rebuild the trust of the community. JAFFE: ...Says Meghan Flanz. She's in charge of turning the West Los Angeles VA campus into a community for at least 12,000 chronically homeless veterans. This plan was part of the settlement of a lawsuit brought by homeless vets. Despite the history of conflict and corruption, Flanz describes this as her dream job. FLANZ: This is a moral imperative. There are veterans who need housing. We've got the space to house them. The property was deeded to us to house them. So we will get this done. JAFFE: The vision is huge. It encompasses not only housing with onsite services but places for residents to socialize, to get job training, to make music and art. The obstacles are also huge, including the need to find funding for renovations or new construction because the VA doesn't pay for housing. So out of the 1,200 or more veterans who might someday live here, there are now just 54 who do - all of them in building 209. It's the only one that's been converted to housing so far. William Williamson (ph) loves it. WILLIAM WILLIAMSON: I look at it this way. It was God given to me. And I bless him and the people here at the building every day I wake up. JAFFE: He was a jet mechanic on an aircraft carrier during the Vietnam War. When the Navy was no longer his home, sometimes prison was. WILLIAMSON: Mostly manufacturing drugs. Last time I got busted, I went for 10 years. JAFFE: Three years ago, Williamson lost his permanent housing in a roommate dispute. Then it was couch surfing, a shelter, and eventually, the street. That was new. WILLIAMSON: It was eye opening, especially at nighttime when you try to find a place to sleep because you never know what's going to happen. JAFFE: Now, Williamson is close to all his doctors at the VA Medical Center who help him with his asthma, heart problems and nerve damage in both legs. And the social services right here in the building work with him on everything from military benefits to grief over the death of a friend. An outside organization provides those services. It's called Step Up On Second. But Tod Lipka, the CEO, says there's one thing his organization can't provide for the residents here. TOD LIPKA: Most people want to live in a neighborhood where other people are. But right now for the first tenants, there's no other housing on the campus. So you're a little bit isolated, too. JAFFE: That will change. Two more empty buildings next to 209 are about to be converted to housing, but the renovations won't be done for almost two years. Even then, there will be around 170 formerly homeless vets living on the campus, a small fraction of the number the VA says will someday live at this former home for old and disabled soldiers. Ina Jaffe, NPR News. (SOUNDBITE OF DISTANT.LO'S "MELODY OF THE SOUL") [POST BROADCAST CORRECTION: In the audio of this story, as in a previous Web version, we incorrectly refer to the Department of Veterans Affairs as the Veterans Administration. And a previous photo caption incorrectly referred to the VA West Los Angeles Medical Center as the West Los Angeles Veterans Administration Medical Center.] Transcript provided by NPR, Copyright NPR.